September 5, 2009 By Charlie Cutshaw & filed under All Articles, Rifles & Carbines, Weapons. The .338 Lapua Magnum is a long-range precision tactical cartridge whose time has come. If there are any doubts, consider the fact that the next U.S. military sniper rifle will be in .338 Lapua caliber. The original round was developed by Research Armament in the United States in 1983 at the request of the U.S. Navy. The .338 uses a necked down .416 Rigby case and in its original configuration launched a 250-grain bullet at nearly 3,000 feet-per-second (fps) with a muzzle energy of over 4,800 foot pounds (ft-lbs). A prototype rifle and ammunition were produced and tested by the Navy, but the cartridge was never manufactured in the United States. Lapua and Norma finished development and got the cartridge into production. 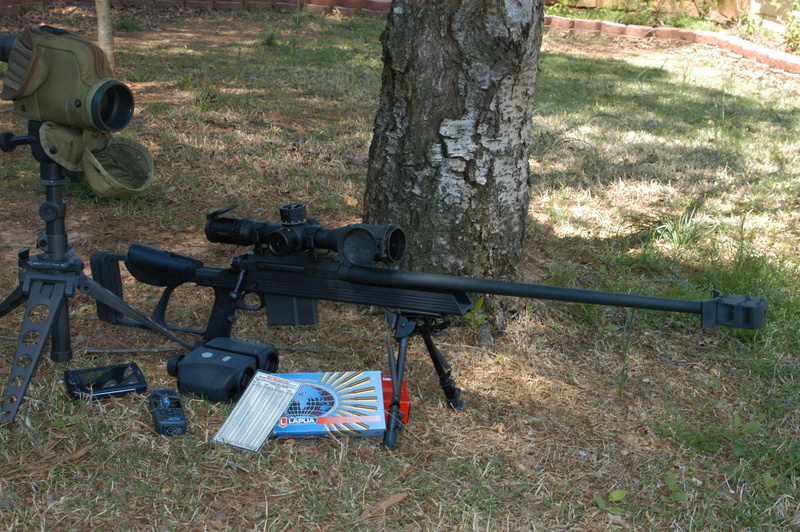 LE sniper trains in suburban environment using Armalite AR-30 in .338 Lapua. Besides Lapua, Black Hills Ammunition now loads both 250- and 300-grain cartridges. In the latter configuration, the 300-grain bullet leaves the muzzle at 2,800 fps with a whopping 5,223 ft-lbs muzzle energy. By comparison, a 168-grain .308 match cartridge has a muzzle velocity of “only” approximately 2,600 fps and 2,180 ft-lbs energy. The .338 Lapua’s ballistics totally overshadow the .308, although most rifles in this caliber are only marginally heavier than precision tactical rifles chambered in .308. Naturally, a large cartridge like the .338 will necessarily deliver more felt recoil than lesser cartridges, but this can be offset by the use of muzzle brakes. The brake on our test Armalite AR-30 reduces felt recoil to approximately that of a .308, although muzzle blast alongside the rifle is pronounced. 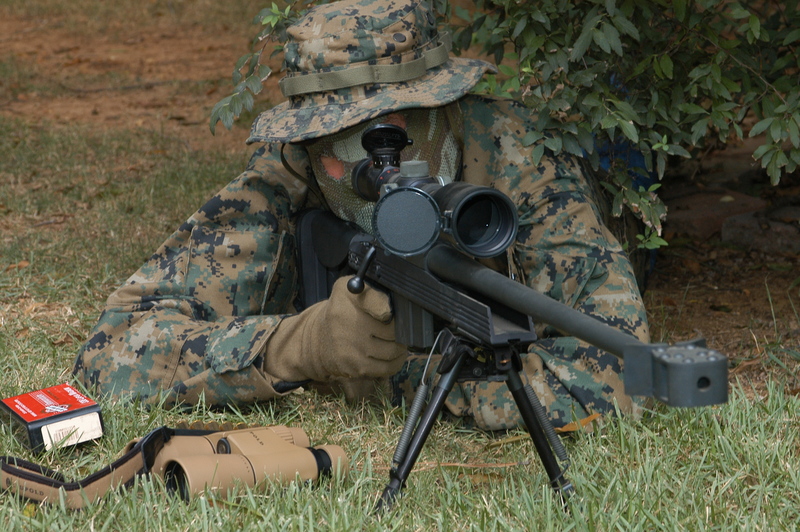 The spotter on a precision tactical team using an AR-30 should position himself slightly to the rear of the shooter’s shoulder to avoid having gases blown into his face. Precision Tactical rifle is only one component of shooting system that includes rangefinding binoculars, spotting scope, PDA with ballistic software and wind/temperature gauge. As the .338 Lapua became accepted by a number of the world’s military forces as replacements for or supplements to bridge the gap between the .308 and .50 BMG, it was only a matter of time before the U.S. military began to consider it. At the time of this writing, the following countries were using .338s: Austria, Germany, France, Finland, Norway, South Africa, Great Britain and selected units within the U.S. military structure. Indeed, the latest Special Operations Command (SOCOM) sniper rifle requirement (January 2009) mandates that one version will be chambered in .338 Lapua. The .338 bridges the gap between .308 caliber and .50 caliber rifles, providing a significant ballistic improvement over .308 caliber rifles without the perceived “overkill” and sometimes negative image associated with .50 BMG caliber rifles. Aggressive muzzle brake reduces .338 Lapua felt recoil to .308 levels, improving accuracy and enabling quick follow-up shots. For law enforcement use, where does the .338 fit in? The .338 gives the precision tactical marksman a huge range and ballistic advantage over any .308 caliber rifle, while adding little to the weight burden that every sniper must contend with. The test AR-30, for example, tips the scales at only 15 pounds. 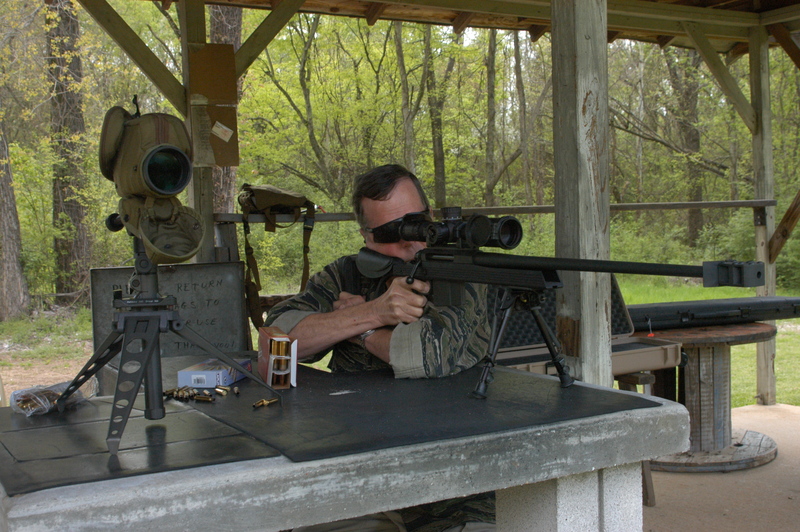 I have tested .308 caliber precision tactical rifles that weigh the same or slightly more. When compared to .50 BMG caliber rifles, our AR-30 weighs ten pounds less than the lightest weight .50 BMG rifle I have ever tested. Most .50 BMG rifles, like the widely used Barrett M82, weigh over 30 pounds. I have fired our personal AR-30 .338 that is the subject of this evaluation at distances of over 1,500 yards with superb accuracy. At closer ranges, typical of law enforcement, where engagement distances are almost never more than 100 yards/meters, the .338 offers the precision marksman the capability of defeating targets that would resist any .308 bullet. AR-30 receiver area shows Premier Reticles Heritage scope, detachable five-round magazine, and receiver that fully encloses chamber area except ejection port. Bolt serves as safety lug. For law enforcement, the .338 bears examination as an alternative to .50 caliber rifles simply because most organizations do not require the terminal ballistics of the .50 BMG cartridge, but wish to have a rifle available whose ballistics exceed those of the traditional .308. This can be used for positive vehicle stops, defeating hard targets such as brick walls and other situations where the .308 or .223 isn’t sufficient, but where use of a .50 BMG rifle might be “overkill” and negatively viewed by civilians or the news media. 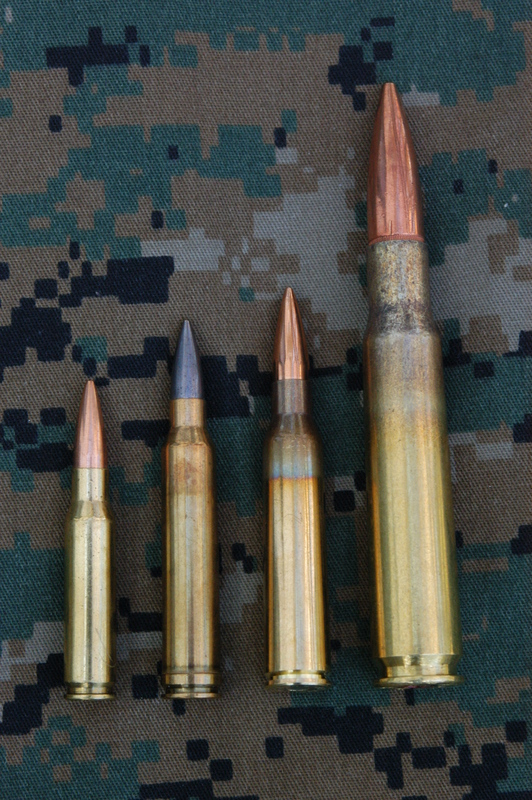 Also, the .338 Lapua is one of the few cartridges whose bullet will reliably penetrate aircraft windshields and retain sufficient terminal ballistics to eliminate targets in aircraft cockpits. The Armalite AR-30 is a bolt-action rifle fed from a detachable box magazine, but differs in its construction from any conventional bolt-action rifle. The AR-30 resembles a scaled down version of Armalite’s big AR-50 .50 BMG caliber rifle, but I like the proportions of the AR-30 better than those of its big brother. The AR-30 is manufactured almost entirely of aluminum alloy and steel, which comprises the magazine, barrel, receiver, bolt, muzzle brake and a few other components. The AR-30’s stock assembly and grip frame, which make up the buttstock, are hard anodized aircraft aluminum. The AR-30’s only non-metallic components are the pistol grip, which is borrowed from AR-15 type rifles, the cheekrest and buttstock pad. Cutshaw sends rounds downrange during test fire of AR-30. Rifle delivered excellent accuracy and total reliability. The barrel is free floated along its entire length and if it were not required for ergonomics, the forearm would be unnecessary. The AR-30 action is bedded via a “V” channel and bedding block in the stock assembly that interfaces with a mating surface on the bottom of the barrel and receiver assembly. The bedding block is a small wedge-shaped steel component that moves vertically. The block has a slight angled surface at the front that interfaces with a similar surface in the stock assembly. When tightened, the bedding block locates the recoil lug in the stock, while the receiver and stock firmly and accurately mate via the “V” shaped channel and receiver. There is no torque requirement for joining the bedding block and barrel and receiver assembly; all that is required is to firmly seat the retaining bolt. This system ensures that there is no “play” between the receiver and stock, and that the bedding is repeatable—that is, it returns to the same relationship even when the rifle is disassembled for maintenance. 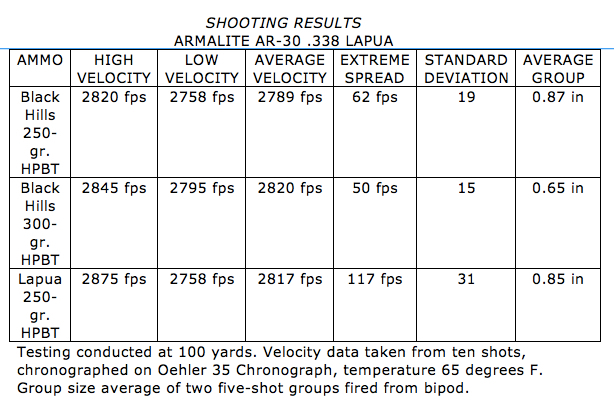 I verified this when my personal .338 Lapua AR-30 was updated during a visit to the Armalite factory two years ago. Although my AR-30 was completely disassembled for tuning, the zero did not change appreciably when we went to the range with Armalite’s CEO Mark Westrom the following day. 300-yard group was approximately one inch across, a remarkable achievement at that distance and equating to substantially less than half MOA accuracy. Group shown was last test group fired prior to moving reticle into center of zero target. The AR-30 is a conventional bolt-action rifle in the sense that it has a manually operated bolt with two forward locking lugs and a safety lug that is integrated into the operating handle, but the design is otherwise unconventional. 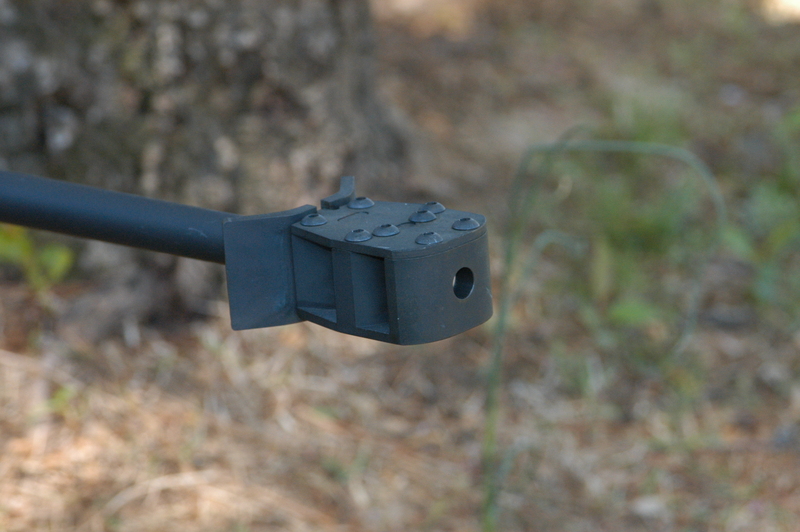 The AR-30 has a “floating” bolt head that flexes slightly to ensure proper lockup and headspace. The extractor is integral to the right locking lug and the ejector is a plunger type, positively ejecting spent casings. My AR-30 placed every spent casing in a small pile about six inches from the right front of the ejection port. The AR-30 receiver body surrounds the bolt, adding strength and rigidity and protecting the rifle’s action from dust and foreign matter. The receiver’s top surface is fitted with a MIL-STD-1913 rail for mounting optics. There are no iron sights. The safety is a small lever at the right rear of the receiver that is applied when moved to the rear and released when pressed forward, like that of a Remington 700. The safety physically blocks the trigger, although the bolt can still be manipulated. Comparison of common sniper rounds: .308 Win, .300 Win Mag, .338 Lapua, .50 BMG. .338 delivers greatly improved performance over .308 or .300 WM in rifles that are only slightly heavier than lesser calibers. The single stack detachable box magazine holds five cartridges. The magazine is retained at the rear by a latch that engages a notched plate spot-welded to the rear face of the magazine. The attachment is positive, although there is some intentional play at the forward end of the magazine. Feeding was absolutely reliable and butter smooth. The trigger is fully adjustable, but Armalite recommends that it be done either at the factory, as mine was, or by a trained gunsmith. I set my AR-30 up with a Premier Reticles 3-15X Heritage scope with Horus Vision H25 tactical reticle. The Premier Reticles scope mated with the Horus Vision reticle should please virtually any military or law enforcement precision marksman, as the scope’s optics are excellent and the reticle is the most versatile and fastest available for any kind of precision shooting. The H25 reticle, designed for military and law enforcement sniper use, has achieved notable success in both Afghanistan and Iraq. Horus Vision scopes eliminate dialing in clicks of elevation or windage, are calibrated in standard milliradians, but have no Mil-Dots. Each milliradian is subtended into 0.2 milliradian increments, so that range estimation using the mil system is far more precise than with standard Mil-Dots, as is targeting. Instead of dialing in clicks of elevation or windage, Horus Vision scopes use a targeting grid that looks busy at first glance, but quickly becomes second nature. In use, the shooter generates “come-up” data using the Horus Vision handheld Palm PDA computer. This data is transferred to a waterproof adhesive-backed paper card that is used to determine precise holdovers for elevation and windage. If time is available and exact precision is desired, the PDA can be used to generate specific targeting data, to include elevation and windage holds for the target to be engaged. Using the scope led to my sole complaint about the AR-30. The rifle’s cheekrest is too low to get a good cheek weld on the stock and isn’t adjustable, so even with the lowest rings I could find, I had to purchase an aftermarket cheekrest from Brownells. This solved the cheek weld issue, but I’d like to see an adjustable cheekrest on this rifle. A recent Leupold product that is ideal for sniper use is the company’s RXB-IV digital laser rangefinding binoculars, which deliver the exact ballistic distance to the target, regardless of slope. Most rifle shooters know that as the angle up or down increases, the true ballistic distance decreases. Previously the shooter had to measure the angle and multiply by a factor to obtain the true ballistic distance. This took precious time, during which the target might go behind cover and disappear. Of course, there were whiz wheels and slide rules to speed obtaining the true distance, but all previous methods took time. Leupold’s RXB-IV binocs not only replace two essential sniper team items—binoculars and rangefinder—with one, but measure the angle and instantly indicate both the measured distance and the true ballistic distance up or down in either yards or meters, so the precision tactical marksman knows the exact hold for precise target engagement. The binocs are waterproof, but not to full milspec of 66 feet. We have used Leupold’s RXB-IV rangefinding binocs and recommend them without reservation to any precision tactical marksman, either military or law enforcement. The RXB-IV binocs have an integral compass for azimuth, but that is not necessary for most engagements. Shooting the AR-30 brought no surprises, as this was my personal rifle, which I purchased after testing AR-30s in .300 Winchester Magnum and .338 Lapua calibers some years ago. Although Armalite guarantees the big AR to shoot minute of angle (MOA), this rifle was well under sub-MOA accurate out of the box and continues to be so five years after my original test. Since my initial evaluation, this superb rifle has accompanied me all over the United States, where I have had the opportunity to shoot it at targets as distant as 1,500 yards. 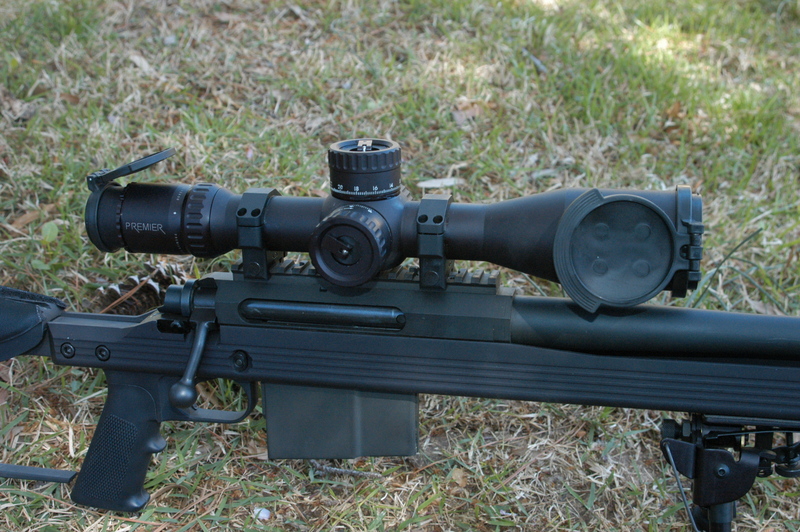 Continued shooting of this AR-30 has proven that it delivers sub-MOA accuracy at any distance. I had to re-zero the AR-30 for this evaluation because I replaced the original scope with the Premier Reticles scope described above. I zeroed the rifle at 300 yards and my best zeroing group fired off the bipod is shown in the accompanying photo. I conducted accuracy testing separately at 100 yards because this is more typical of law enforcement engagement distances. 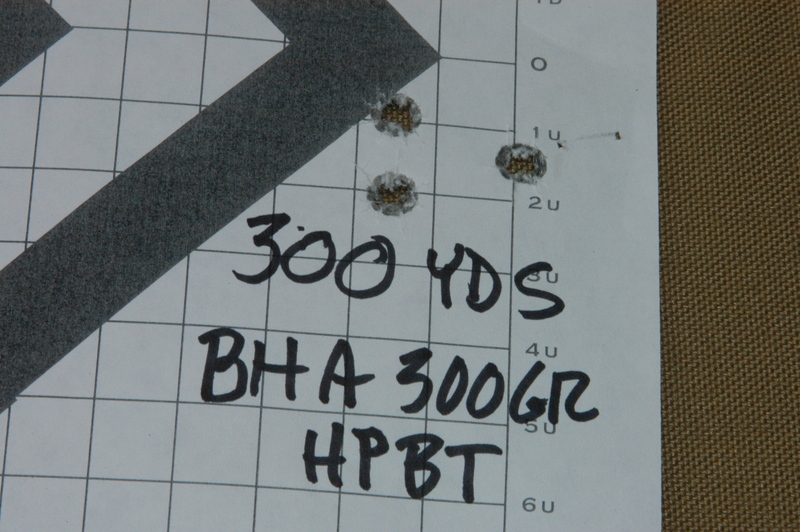 As with the original test, I used Black Hills 250- and 300-grain and Lapua 250-grain ammunition. Although the AR-30 was very accurate with all ammunition, it once again delivered its best performance with the Black Hills 300-grain load, achieving an average shot group only 0.625 inches in diameter. Both five-shot groups were essentially “cloverleaves,” with bullet holes touching. Considering the diameter of the .338 bullets, that is a remarkable level of accuracy. Suggested retail of the AR-30 in .338 Lapua Magnum is $1,882. If SOCOM, a law enforcement agency or, for that matter, a private citizen is looking for a superbly accurate .338 Lapua Magnum rifle, the AR-30 is a good place to start.